Looking for a creative touch to jazz up your home’s curb appeal? Elegant landscaping or an extravagant doorway might be the obvious choice, but why not consider sprucing up your driveway instead? Rather than resigning to a run-of-the-mill concrete slab, opt for an imaginative and bespoke option to add immeasurable aesthetic appeal to your home’s exterior. Better yet, you’ll add significant resale value to the property as well. 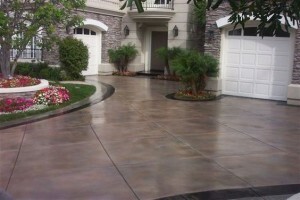 Here are 8 innovative suggestions to get your driveway looking shmick. For a unique combination that blends seamlessly into the landscape, opt for a mix of classic brickwork and hardy ground covers. 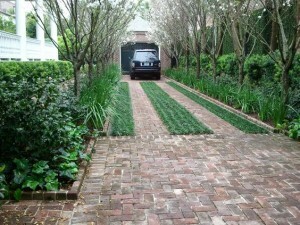 Earthy coloured bricks provide adequate grip to guide your vehicle into the carport, while sturdy ground covers can be strategically inserted amid the grass to create a timeless eco effect. 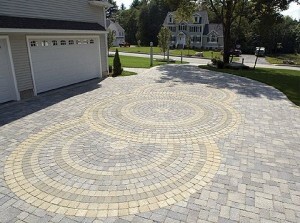 For a decent dose of cost-effective curb appeal, try adding a few coaxial swirls to your paved driveway space. The impressive effect can be achieved using a basic brick or concrete paver, meaning this time-old artistic expression will by no means break the bank. Looking for the luxuriousaesthetics of brick on a plain ol’ concrete budget? Textured concrete is the solution! This deceptive design uses block shaped stamps to create the impression of red brick paving on a cheaper concrete layer. In fact, the entire install will cost you about half the price of the real thing. Few products out there can match the curb appeal of natural stone tiles, particularly those which come in a lovely earthy colour to complement your home’s exterior. Check out your local landscaping outlet to see what’s available within your price range, being sure to select a product that isn’t prone to being chipped or cracked. When done sparingly around the edges, a few elegantly engraved or embossed tiles can make your driveway stand out from the crowd. There is no shortage of different designs to choose from, and pre-engraved tiles are more affordable than you think. 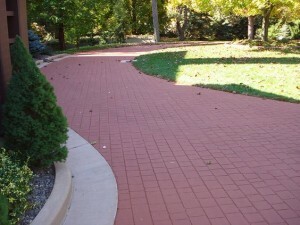 Coloured concrete which adds a splash of colour to your driveway is an easy way to enhance its aesthetics. 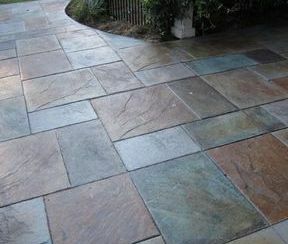 For a consistent and cool effect, opt for a pigment which is stirred into the concrete before mixing. Conversely, stains and dyes can be added to pre-mixed concrete for a topical approach which can result in a funky kaleidoscopic swirl. 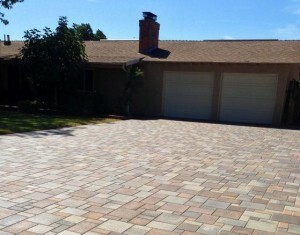 Brighten up your dull driveway with a set of paver lights placed along the edges. These low voltage contraptions come with super tough lenses which can withstand being driven over and cost as little as a few hundred dollars to install. Reversing out of the driveway at night may prove much easier too! Spice up your existing cost-effective concrete driveway by adding a colourful outer layer which has been stained in a vibrant hue. This way, you can achieve a nice finishing touch on a modest budget. Any of the above options tickle your fancy? 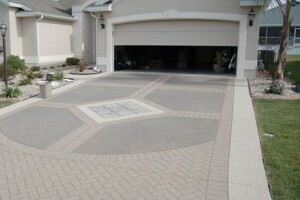 Then get in touch with the expert team at Simply Driveways to see what they can do for you.